This week, I’m visiting my sister, Briel, in Philadelphia and checking out some of the things that are happening here on the sustainability front. She’s cooked up a quite ingenious way of adding “brown” material that to her compost bin, and I wanted to share it. 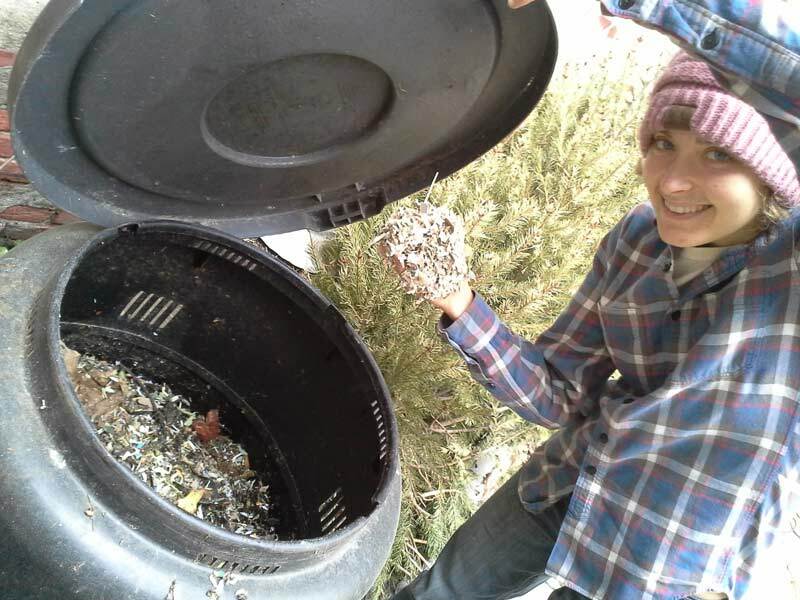 In this post, I’ll talk about the basic principles of composting and then discuss what she’s doing using a permaculture design framework. Moisture: A slightly damp pile will break down faster than one that is dry. Food scraps and other green materials often add a lot of moisture, but depending on what you are adding, you might need more moisture. While there is clearly some things you need to know to get a very good compost pile going, if you just pile up everything and leave it be, you’ll still have compost. However, understanding and maintaining the balance of these two things is important if you want compost in a timely fashion. All materials will eventually break down, but the difference between a quick 3 month turnaround and a long 1 year turnaround is determined by the ratio of green to brown as well as the airflow, heat, and bacterial action in the pile. I also want to point out that sheet mulching and vermicomposting (with worms) are also both based on these principles. Vermicomposting starts with a large amount of wet, aerated, brown material, to which small amounts of green material are added. Sheet mulching does a similar thing, with mostly brown materials being added between sparse layers of green materials to create new garden beds. For me living in a semi-rural area, its easy to snag enough leaves each fall to have a very healthy compost pile and to add those leaves to green garden waste and kitchen scraps. The leaves function as my “brown” material; and, as I described in a previous post, I give a lot of them to my chickens to break down (harnessing the power of the chickens’ natural tendency to scratch at the ground all day). Between what falls off of my own trees and the bags of leaves my neighbors so graciously put by the side of the road each fall, I have more than enough for my composting needs. But my living circumstances are primed for this kind of easy composting. What about someone who lives in the city? 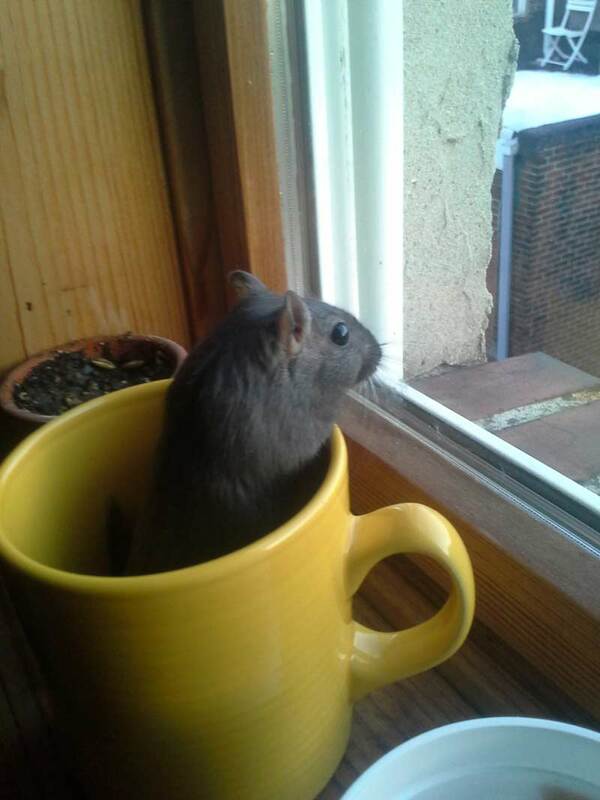 Enter….gerbil composting. My sister, Briel, lives in the heart of Philiadelphia, in row houses with a tiny back yard. Her tiny backyard does have a mulberry tree, which gives them some leaves each year for their compost. But, as she points out, they don’t get nearly enough leaves to maintain the 25:1 ratio they want for a healthy pile (and since they are so close to their neighbors, keeping the pile healthy and not stinky is also important.) So, my sister began to seek out new ways of integrating brown material into her compost pile. One of the first principles in permaculture design is “catch and store energy” (Holgren, 2011). What energy is out there for her compost pile, and how can she store it effectively? Another principle is “produce no waste.” Let’s take a look at these two permaculture design principles in action. 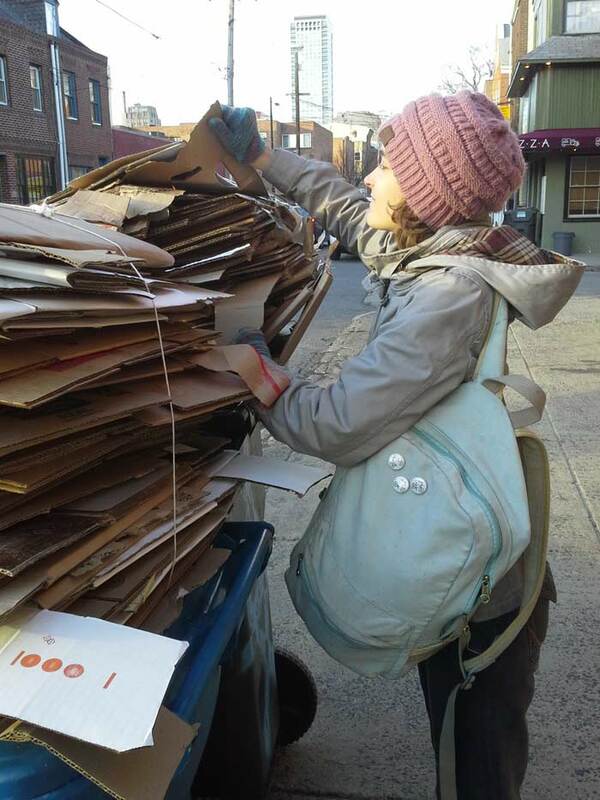 The resources and energy flows that Briel has access to are the following: 1) lots of human-generated waste put out on the streets weekly by neighbors in the form of cardboard; 2) a biking and walking lifestyle that allows her easy access to said waste and 3) and her pet gerbils and their natural nesting behaviors. The Cardboard: Briel walks or bikes everywhere and is always finding herself walking past recycle bins full of cardboard boxes and tubes. She need doesn’t go out of her way to find this stuff, but simply integrates it into her existing travel patterns. As we are walking down the street, she’ll simply pick up a cardboard tube or small box from recycle bins or garbage bins and put it into her backpack. She’s taking another person’s waste product and turning it into a resource. By the time she get where she’s going, she has more than enough for her gerbils. The Gerbils: Gerbils have a natural tendency to chew paper into small bits. They do this with the same speed and intensity that my chickens scratch at the earth. They love chewing anything cardboard. 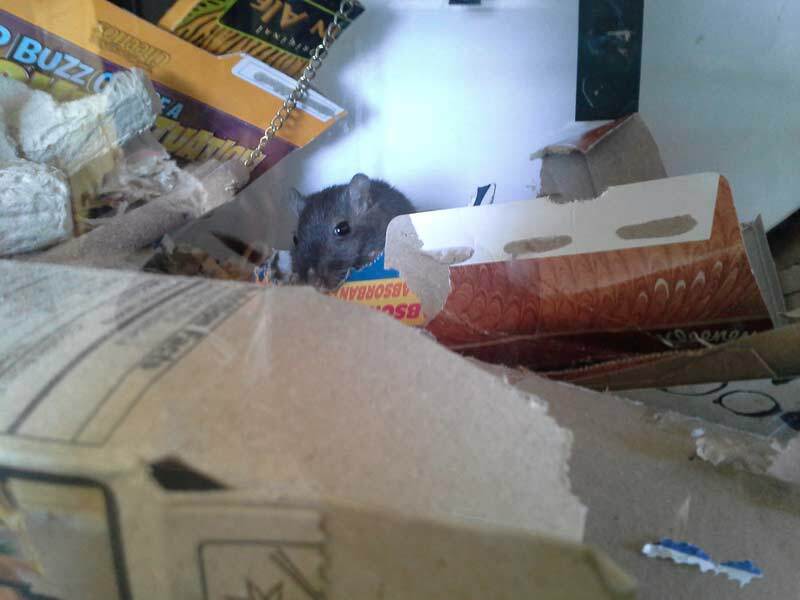 In a day, her three gerbils could easily chew down 25+ paper towel rolls or numerous small boxes, in addition to debris from her mulberry tree. Briel gives the gerbils copious amounts of her found cardboard, and the gerbils gleefully turn it into small bits of shredded paper. Briel has to clean out their cage at least once a week to ensure that the paper doesn’t pile up too much nor start to smell. 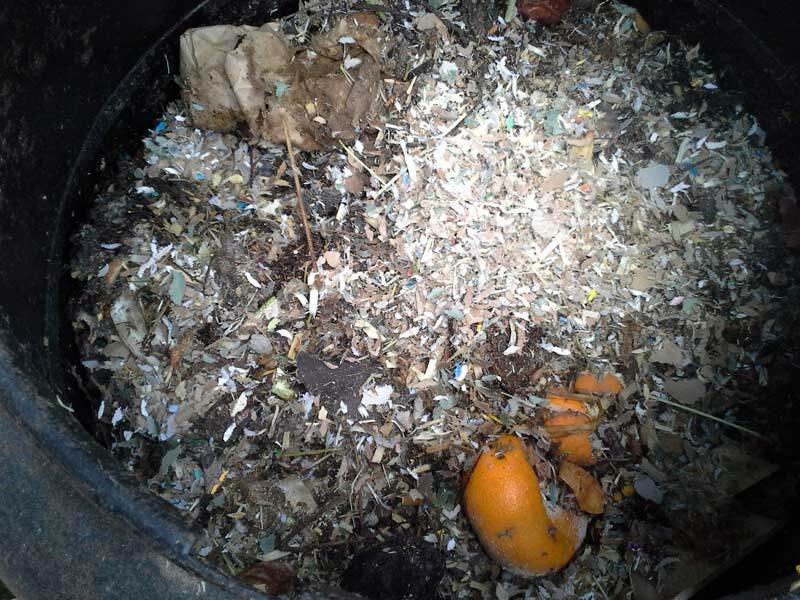 The Compost: Now, most pet owners would see the shredded cardboard and paper by the gerbils’ natural nesting activity as a waste product. But Briel realized that the gerbils’ shredded paper was the perfect thing she was lacking for her compost pile for her ratio of brown material. So she puts all the paper into the pile along with her kitchen scraps, and she has the perfect ratio of materials. I think this is a really great example of permaculture design in action–using the existing resources in our landscape and homes to fill needs, taking a “waste” product from the environment and turning it into a valuable resource, and using the existing energy flows in the home. I’m not advocating that every city dweller go out and adopt some gerbils to enrich their compost pile. What I am suggesting is that we can use permaculture design principles to create solutions to create and store energy and to produce no waste–and this is a great example of how it is done. How might these principles be enacted in your own life? Thanks for posting this, I love to see my boys contributing to the world!